Following numerous stages of Closed Tests and three major Open Beta Tests, we are happy to announce that the new aircraft carrier gameplay is ready and will be arriving with Update 0.8.0. 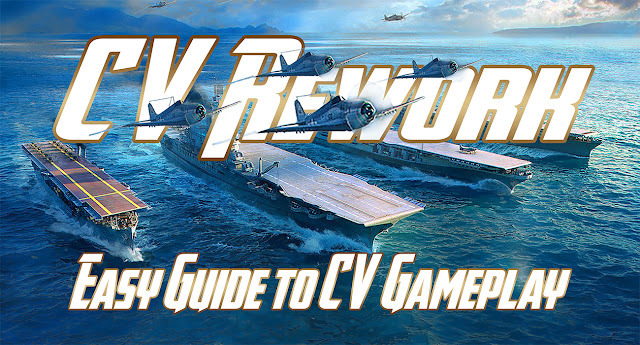 We have prepared several articles for you cover the most relevant information about the updated gameplay and various changes that have been applied to aircraft carriers. In this first article, we’ll take a look at the main changes and basic elements that you need to know in order to master the new gameplay relating to the ship type. Your aircraft carrier transports aircraft that are ready to take off at your order from the first moment of a battle, so now you don't have to wait for a squadron to get ready for takeoff. In the new concept, keyboard and mouse become equally important tools for controlling your aircraft. 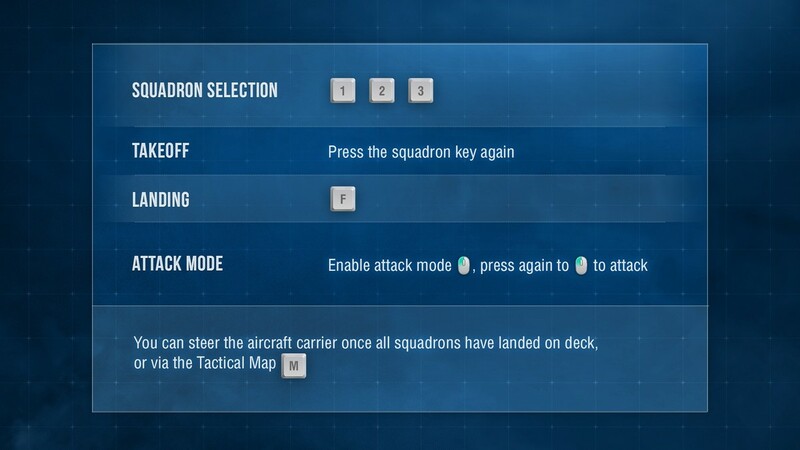 To select a squadron, you need to press keys , , or . Upon pressing the selected key the second time, the associated squadron will take off. launches a new type of aircraft—attack aircraft, —torpedo bombers, —dive bombers. Each squadron launched will only be composed of a single type of aircraft. The squadron’s speed can be changed using the [W] and [S] keys, which increase or decrease the speed of your aircraft and consume Boost in the process. Use the [A] and [D] keys to turn. Besides these controls, you can use the mouse for more precise aiming. By doing so, your aircraft will turn more smoothly. This is important when aiming at a target, because in most cases active maneuvering increases the spread of your attack. Boost is an engine enhancement which allows a squadron to significantly accelerate or slow down. Please note that the squadron’s turning radius depends on its speed. If you fly at maximum speed, its turning circle will be made along the largest radius. To turn more quickly, the squadron needs to slow down as much as possible. Boost is displayed on a scale to the left of your aircraft, and recharges when it’s not in use. Instant full restoration is possible with the use of a special Engine Cooling consumable. Please note that you can't accelerate until Boost has been restored to a certain level. The previous squadron has spent all of its ammunition and is returning to the aircraft carrier. All the aircraft in the squadron were destroyed. The order to return was given by pressing [F]. Once this order has been given, it cannot be canceled. 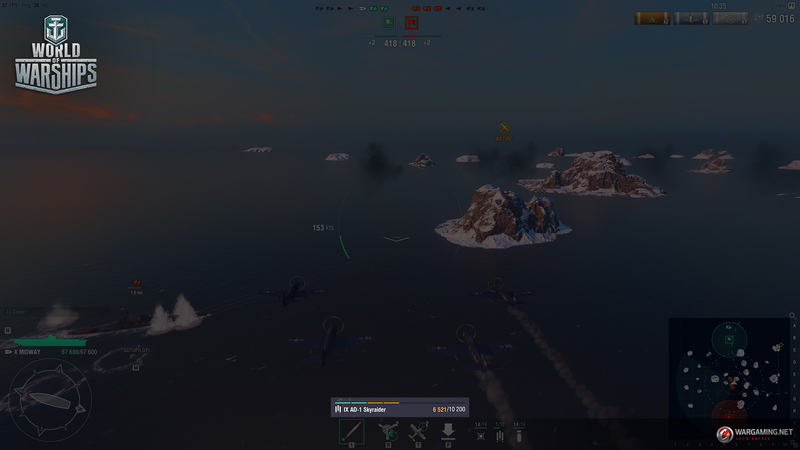 Aircraft take the shortest route when returning to the carrier, and having reached a certain height, are no longer able to spot, while also being invisible to enemy squadrons and ships. Whilst in this state, they cannot be damaged or shot down. Aircraft that manage to return to the carrier successfully replenish the squadron on the deck, and are ready to take off again immediately. Aircraft now have a brand new attack mode. Once you've selected your target and are ready to attack, hit the left mouse button to separate a flight from the squadron and start the attack run. Depending on the squadron type, you will either see an ellipse for launching rockets and dropping bombs, or the torpedo reticle for a torpedo attack. At this point, the reticule will be colored yellow, and a special timer will indicate when the flight is ready to attack. When in a state of attack readiness, the reticle turns green. To deliver an attack, simply click the left mouse button again. Keep in mind that aircraft need time to make a target run and carry out a successful attack, and furthermore, that projectiles need time to reach their target. You need to be sure to take the correct lead on your target and consider the size, speed, and manoeuvrability of the ship you’re aiming at. The rest of the squadron falls out of the player's control, follows the attacking flight, and then comes back under control once the attack is completed. The aircraft that carried out the attack return to the carrier to replenish their ammunition. If, during an attack, any aircraft in the attacking flight is shot down, it will be replaced by another one from the squadron. You can carry out several attacks in one sortie until you exhaust all available ammunition. If you remain in attack mode for a longer period without carrying out an attack, all aircraft rejoin the squadron, and you can try to make another run on the target. If you want to take a look around and check what your target is currently doing, you can use the free look camera. It’s activated by clicking and holding the right mouse button. While using the free look camera, your aircraft will stay on course. Depending on the aircraft carrier you use, there are different types of aircraft on the deck, and all of them are ready for immediate take-off. If there are fewer aircraft than the maximum number of possible aircraft, the preparation of replacements begins, leading to an aircraft appearing on deck, ready for take-off. The preparation of attack aircraft, dive bombers, and torpedo bombers takes place simultaneously and begins immediately after a squadron is launched. A squadron can be launched even if not all aircraft are ready, but in such cases the squadron taking off will be incomplete. The number of aircraft that can be replaced in a single battle is unlimited. 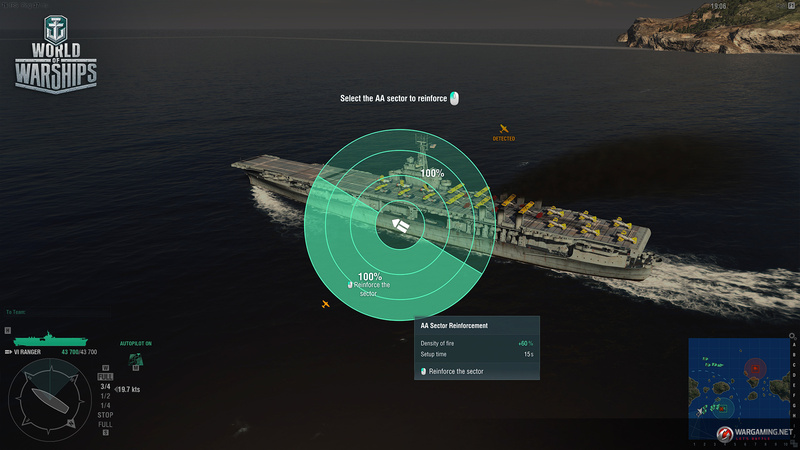 This prevents the situation in which only an aircraft carrier is left under the player’s control, which would mean no chance of influencing the outcome of a battle. But don't waste your aircraft mindlessly, since you will have to wait a long time until the new ones are ready for takeoff, significantly reducing your battle efficiency. Take good care of your aircraft, because the fewer planes you lose, the quicker that a new complete squadron will be ready! Attack aircraft are a new type of aircraft that carry unguided rockets. These rockets are most efficient against lightly-armored targets, and they are quite precise. More often than not, this aircraft type has a high speed and can reach its point of destination within a short period. The reticule of attack aircraft is an ellipse or a circle with special marks inside that show the dispersion when fully aimed. The ellipse reduces to the ideal radius if aircraft aren’t in the process of performing sharp maneuvers. You can launch rockets as soon as they are ready, but for maximum efficiency you should wait until the ideal radius is formed. Attack aircraft have rather quick aiming capabilities and can drop their payload almost immediately. Dive bombers are strike aircraft equipped with bombs that can inflict a great deal of damage to armored targets. The reticule of dive bombers is quite similar to that of attack aircraft, but unlike the latter, the dive bombers' ellipse is bigger and expands more during active manoeuvres. When attacking with dive bombers and attack aircraft, consider the features of the ellipse of your aircraft and choose the correct approach point—whether it’s from the bow/stern, or from the sides. The aiming distance depends on the current speed of the aircraft, its height, and pitch. Keep in mind that the reticule of dive bombers moves rather slowly when ascending and diving, but accelerates when approaching the target! 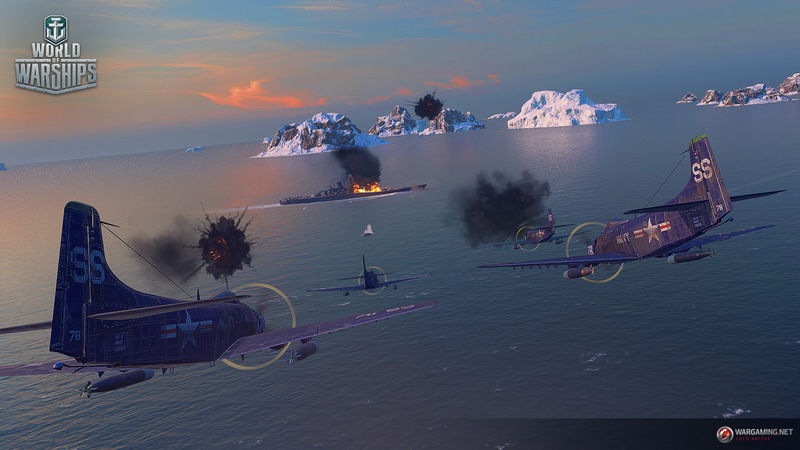 Attacking with torpedo bombers differs significantly from attacking with other aircraft types. The torpedo drop zone is similar to that of ships using torpedo launchers. Depending on the aircraft, when getting ready for an attack and while decreasing in altitude, the torpedo cone starts to narrow. The cone is divided into sectors equal to the number of torpedoes ready to be launched by your aircraft. You can drop several torpedoes at once, but it’s better to wait, to launch them in a narrower spread and with higher accuracy. Torpedoes need time to arm before hitting their target. To make this aspect clearer, torpedoes' arming distance is highlighted yellow and their range is highlighted green. In order to carry out a successful run with torpedo bombers, you need to switch to attack mode at a significant distance from the enemy, keeping in mind that you must take a target lead and that your opponent might make evasive manoeuvres. 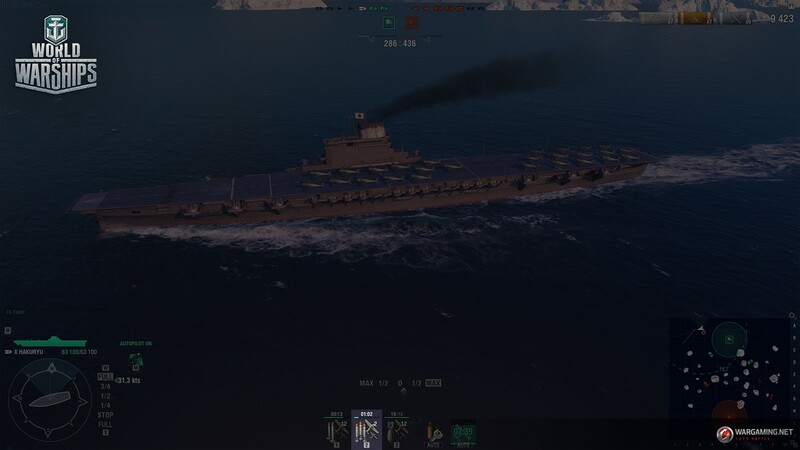 You can see the radius of your torpedoes' progression on the minimap. Aircraft of each nation will have their own unique characteristics and settings. More details about them will be available in a separate dedicated article. We have reworked the aircraft detectability mechanics. Now the detection of aircraft is affected not only by distance and weather conditions, but also by the terrain. 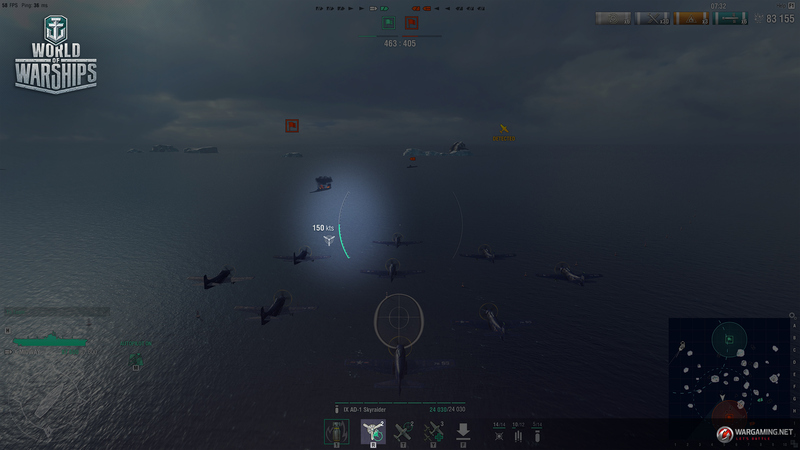 If there is no line of sight between your squadron and the enemy, you can't spot each other. This gives rise to new tactical possibilities, for example, the chance to use terrain to approach the target and attack while undetected. Cyclone and local weather affect aircraft in the same way as they do with ships. To improve the balance between aircraft and destroyers, squadrons have lost the ability to spot torpedoes. This change will also affect the Fighter and Spotting Aircraft consumables. Aircraft HP and characteristics can be modified with the help of upgrades and Commander skills. More details about the possible modifiers will be available in a dedicated article. Aircraft parameters are displayed when you hold the [H] key. As before, ships defend themselves against aircraft using their long-, medium-, and short-range AA defense mounts. 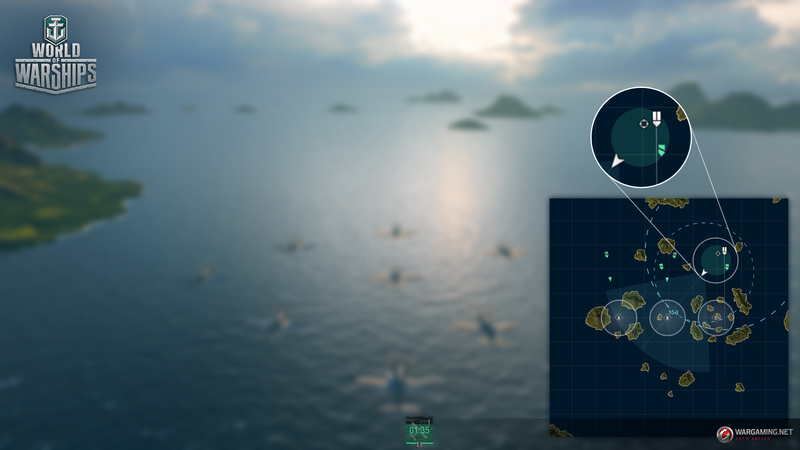 With the new concept, we tried to keep the unique AA defense settings for each ship, while making the mechanics more understandable and player-friendly. Short-range AA defenses include guns up to 25 mm, medium-range AA defenses include guns up to 85 mm, long-range AA defenses include guns with a caliber over 85 mm. The working areas of the AA guns of the long-, medium-, and short-range don't overlap. Long-, medium-, and short-range mounts constantly inflict a certain amount of damage to a randomly selected aircraft in the squadron in accordance with a preset frequency. Additionally, long- and medium-range AA defenses fire shells that explode in the air in a squadron's path. If aircraft move into the explosion zone, they receive damage. In this case, only aircraft in the explosion zone receive damage, as opposed to the entire squadron. You can reduce damage from long- and medium-range AA defense by actively manoeuvring and varying your speed. However, this is difficult for squadrons with a large number of aircraft. Therefore, when attacking a ship with powerful AA defenses, be prepared that some of your aircraft are likely to be destroyed on approach to the target. 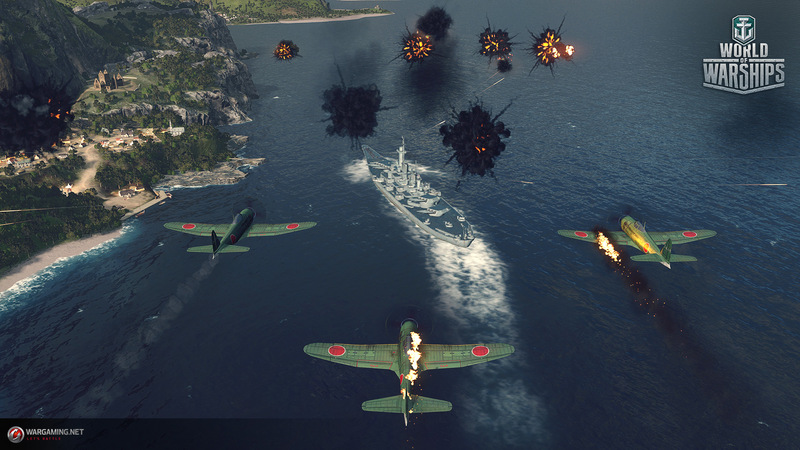 If a ship is under attack from several squadrons, the majority of explosions from AA defense shells focuses on the first squadron, while the remaining squadrons face less intense, but equally spread, resistance. Permanent damage from AA defense mounts is always equally effective, regardless of the number of squadrons within range of the AA defenses. A player controlling a ship can try to predict from which side the ship will be attacked and accordingly intensify the density of fire in that sector, increasing the damage per minute caused by AA defenses. To do so, it is necessary to select a priority AA sector, which can be done by holding the [~] or [O] key. In the menu that appears, you can select a priority sector by clicking the left mouse button. The effectiveness of a priority sector is increased at the cost of reducing the effectiveness of another sector. Reinforcing sectors, or switching between them, does not happen instantly. Therefore, be sure to choose the direction which you think carries the most risk in advance. Changing a priority sector or restoring the initial state is done in the same way. The effectiveness of AA defense mounts can be increased with the help of upgrades and Commander skills. More details about them will be available in a dedicated article. Each squadron now has its own consumables, with the number of charges and type depending on the aircraft. Let's take a look at the consumables the squadrons have now and how the ships' consumables have changed. This consumable appears on aircraft onboard Tier VI aircraft carriers. In the new concept, fighters are now a consumable and can be called into battle by the player when necessary. Upon activating the consumable, a flight of fighters is called to the current squadron's position. It takes some time for the fighters to arrive, after which they patrol the area that they have been called to. If enemy aircraft appear within the patrolled area, your fighters will attack them. Fighters can destroy as many enemy aircraft as their number patrolling the area. Afterwards, the consumable effect expires, even if they have shot down fewer planes than the number of fighters in the flight. Fighters will also leave the patrol area when the consumable action time runs out. You can avoid facing enemy fighters and leave the patrol area without losses if you react quickly enough. If a group of enemy fighters is set to attack your group of aircraft, you have a chance to shake them off if they can't catch up with you within a certain period of time. But you will have to use the engine boost and have specific skills and upgrades equipped in order to increase the speed of your squadron. If several squadrons enter an area patrolled by fighters, the latter will attack the squadron that has been in the area the longest. The most effective strategy for countering enemy fighters is to call your own fighters into the area of action of the enemy's fighters, or to make their areas overlap. Don't forget to direct your squadron to leave the area of action of the enemy fighters before they begin their attack. Fighters no longer affect the accuracy of aviation attacks. The Catapult Fighter consumable is simply called Fighter from now on. It works in a way similar to that of attack squadrons, but with the difference that Fighter squadrons accompany the ship, as opposed to being called to a certain point on the map. 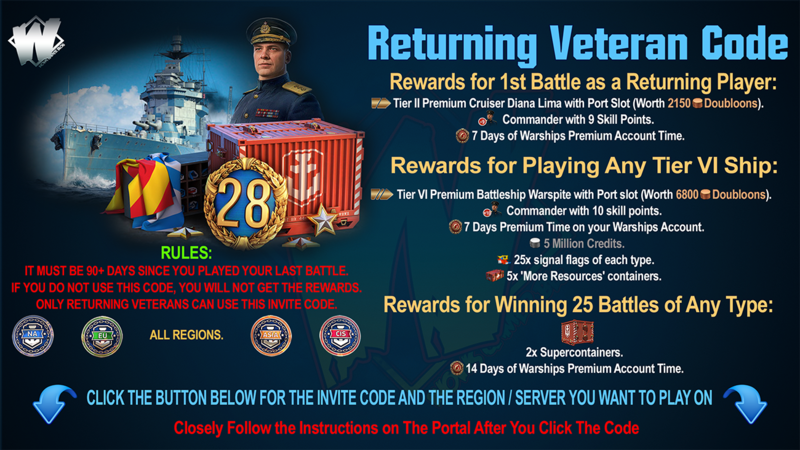 The values indicated below will be accurate at the release of Update 0.8.0, but may change during further ship balancing procedures. Aircraft carriers launch 4 fighters, and they will patrol the area around the carrier for 10 minutes. Reload time is 40 seconds. Attack squadrons call in 1 to 4 fighters, which stay active for one minute and reload within 10 seconds. 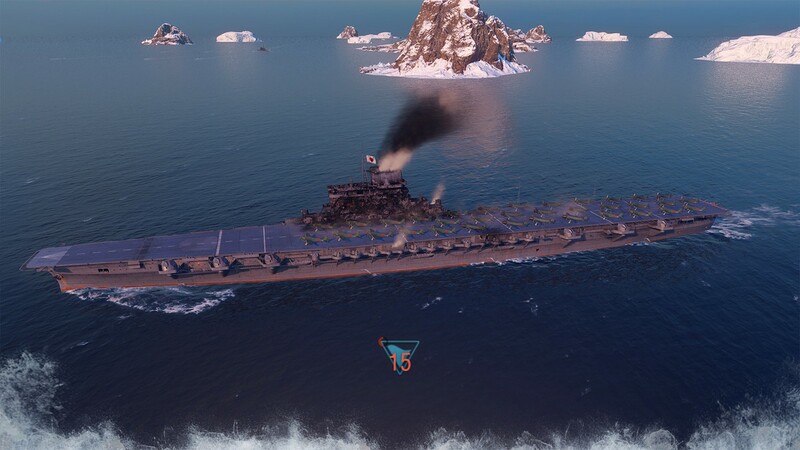 Cruisers and battleships call in 1 to 4 fighters, with the consumable action time of 30 seconds and reload time of 90 seconds (Premium) / 135 seconds (standard). Although the consumable's action time has been significantly reduced, the mechanics of fighter operation have become completely different, allowing them to effectively protect the ship from enemy air raids and ensuring that they will shoot down aircraft in their area of operation. AA defense against fighters works the same way as against attack squadrons. This consumable is available on all carrier-based aircraft. We previously mentioned that aircraft can accelerate and decelerate using the engine boost. When the boost runs out, players can quickly restore it with the help of the Engine Cooling consumable. During the consumable's action time, boost is not spent while being used to vary the speed of the squadron. This consumable appears on torpedo bombers onboard Tier VIII aircraft carriers. Using this consumable, players will be able to restore a certain percentage of their squadron’s HP. This equipment will hardly change: it still improves the effectiveness of AA defenses and the damage they inflict, but will no longer affect the accuracy of aviation attacks. The new concept changes the dynamics of aircraft carriers by focusing control on one thing at a time: either a squadron or the aircraft carrier. You steer your aircraft carrier using the WASD keys only while you are in control of the carrier. However, if you need to change the route of your aircraft carrier while controlling a squadron, you can use the Tactical Map [M] and set waypoints for the autopilot. Along with the changes in the gameplay of aircraft carriers, the logic of the autopilot has been improved as well. Now the ship can move astern. 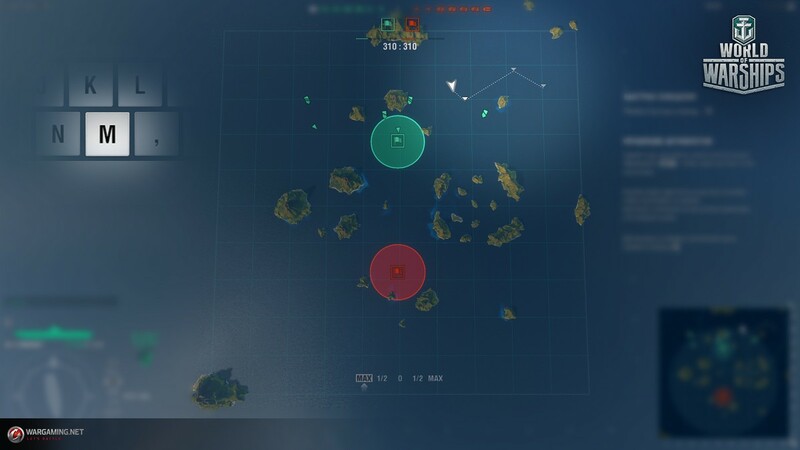 To do this, simply put a waypoint on the minimap astern of the aircraft carrier. The speed of the repair of negative effects for aircraft carriers has been changed, which should allow the player to put greater focus on controlling the squadron. 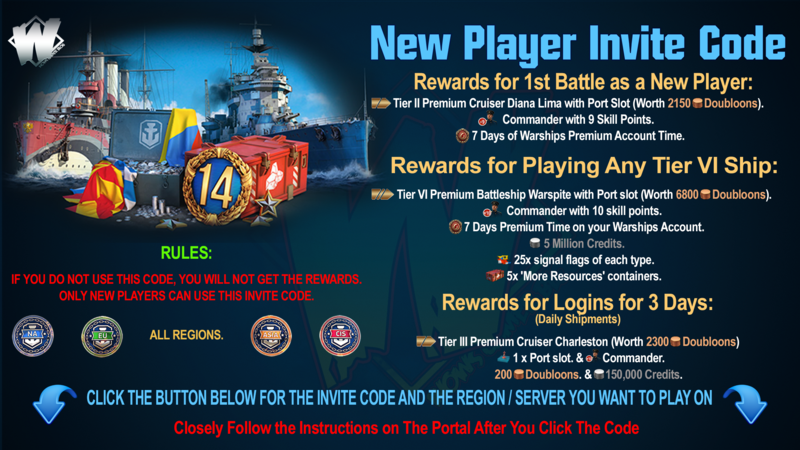 For now, the game will have the values indicated below, but they may change during the ship balancing procedures. Fire extinguishing time on new aircraft carriers is now 5 seconds only, recovery from flooding—20 seconds, and engine and steering gear repair time—10 seconds. The Damage Control Party consumable is activated automatically if the ship is on fire, flooded, or her steering gears or engine have been damaged. Thus, the rare instances of fires or flooding won't cause too much trouble. If your aircraft carrier has been detected, the Fighters consumable gets activated, which will automatically launch a squadron to defend the carrier from enemy air raids for a period of 10 minutes. An aircraft carrier will find it rather hard to destroy another carrier—an attack squadron will have to face both fighters and very powerful AA defenses. For aircraft carriers it will be more effective to choose other targets in battle, leaving enemy aircraft carriers for later, if the situation requires it. In such cases, the sinking of an aircraft carrier with another ship of the same type is still possible. If your aircraft carrier is destroyed, you will still retain control of your squadron until all shells are fired or until three minutes expire. 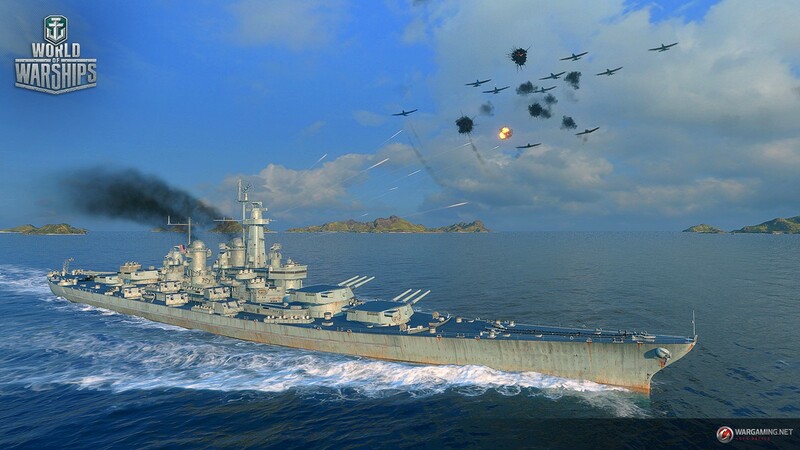 We expect this revamp of what has typically been a difficult ship type will make battles in World of Warships more exciting and balanced.